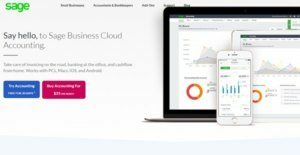 Sage One is an easy-to-use cloud-hosted accounting and payroll software for small business. It offers dashboards, graphs, and transaction drill-downs to provide you and your accountant a clear overview of your business at any time via the web. It has cross-platform and multi OS capability and can work with PCs, Macs, iOS and Android as well as desktop, tablets and smartphones. It lets you work anytime anywhere, collaborate and share, and be compliant with the latest rules and regulations. It gives you bank-level security with regard to your data and transactions, and provides reliable customer support through phone, knowledgebase, and live chat. Among its functionalities are supplier purchases and customer sales history, along with basic income and expense tracking, and bank statement imports which enable you to manage your banking and cash flow. You can also process quotes and send them to your customers on-the-fly. If you need directions, you can use the map links to find your way to your customer’s offices. The app is easy to navigate with an appealing dashboard. The summary tabs on the dashboard provide you a graphical overview of your company’s sales, expenses, cash flow, and forecast cash flow. Sage One uses 256-bit encryption on your data which is the same level of security as your online bank. Your data is stored in the cloud and is subject to far more rigorous security than your internal servers. All your cloud data also undergoes instant automatic backup. As long as you have an internet connection, you can log into Sage One no matter where you are, and what device you use. Just open your browser and log in. The software also allows you to invite other users like your accountant. Your accountant can log in at any time to make sure that you always have up to date and accurate information at all times. Both of you can even be logged in simultaneously to collaborate and discuss your business’ financials. Sage One apps are available for Android and iOs devices, allowing you to send quotes and invoices directly to your customers. You can log on from wherever you are to view customer information, record notes, search for customers and contact them straight from your smartphone. You can find your way to your customer’s offices using the map links, and process quotes and invoices, or convert quotes to invoices, and email these to your customer before you leave their offices. Likewise, you can use your phone to take a photo of your receipt, enter your expense details, and quickly update your Sage One bank account. The Sage One dashboard offers graphical displays so you don’t have to read through the usual text style reports to understand what’s going on in your business. The dashboard is customizable, letting you select the display you prefer when you log into Sage One. There are currently over 20 different displays you can choose from. Sage One has been designed to help you easily navigate between tasks. From one place in Sage One you are able to see a list of all quotes and, as your clients give you feedback, you can quickly assign a status to each quote (e.g. accepted or declined). From this same page, you can also swiftly link the quote to an invoice, eliminating retyping of lines. You may just want to email the quote to the customer again and this too can be done from this one central place. There’s lots of quick links in Sage One for various activities and, through clever design, have been made clear and understandable so you can complete tasks quickly. Sage One recognizes transactions that come through every month and automatically allocates them to the right account. You can teach Sage One to recognize references and over time, you can halve the number of manual allocations you need to do. If you use automatic bank feeds, it also means that you never have to capture lines into your cashbook. It can link into your internet banking and feed your statement straight into your cashbook. When you invoice customers, they will be directed to their very own zone where they can see all invoices, paid or unpaid, run a statement, update their details, and most importantly, easily select which invoices they want to pay. They can then use Sage One’s own payment gateway (or one of their choice that integrates with the platform like PayPal) to make the payment, instead of having to log into their own internet banking and creating you as a beneficiary. It's crucial to keep in mind that hardly any software in the Accounting Software category is a perfect solution able to match all the goals of all business types, sizes and industries. It may be a good idea to read a few Sage One reviews first as some software can excel just in a very narrow set of applications or be designed with a very specific industry in mind. Others can work with a goal of being simple and intuitive and therefore lack advanced elements desired by more experienced users. You can also come across solutions that cater to a broad group of users and provide a powerful feature toolbox, however that usually comes at a more expensive price of such a service. Be certain that you're aware of your needs so that you choose a solution that provides exactly the features you look for. How Much Does Sage One Cost? We realize that when you make a decision to buy Accounting Software it’s important not only to see how experts evaluate it in their reviews, but also to find out if the real people and companies that buy it are actually satisfied with the product. That’s why we’ve created our behavior-based Customer Satisfaction Algorithm™ that gathers customer reviews, comments and Sage One reviews across a wide range of social media sites. The data is then presented in an easy to digest form showing how many people had positive and negative experience with Sage One. With that information at hand you should be equipped to make an informed buying decision that you won’t regret. What are Sage One pricing details? What integrations are available for Sage One? If you need more information about Sage One or you simply have a question let us know what you need and we’ll forward your request directly to the vendor.